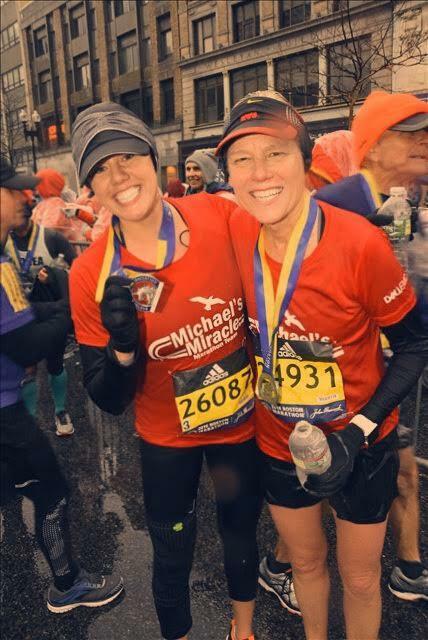 On a rainy, windy day, Cindy and Katie Walls talked about all kinds of things during their 26.2-mile run. It wasn’t just any run. It was the Boston Marathon. They had been planning to each take the race at their own pace, but the mother and daughter decided to run it together as they were walking to the start on April 16. “We trained throughout the winter all together so it was just kind of like another long run with a couple more spectators and a much grander finish line,” said Katie Walls, 28, of Washington, D.C. Even though they normally run at different paces, Katie’s mom, Cindy Walls, 60, of Arlington, said because Katie was dealing with an injury, they were able to do most of the long runs in the training cycle together, too. Those runs provided an opportunity for them to chat for a few hours. The mother-daughter team also raised more than $94,000 for The Michael Carter Lisnow Respite Center ahead of this year’s race. Although Cindy has qualified for Boston each of the 24 years she’s run the race, it’s the cause that keeps her coming back. Her sister, Sharon Lisnow, lives in Hopkinton, Mass., the town in which the Boston Marathon begins, and she runs the respite center for disabled children and young adults that bears her son’s name, Cindy said. “Qualifying for Boston as an athlete is great and it’s one of my goals, but I run Boston because I raise money for my sister’s foundation,” Cindy said. The Michael Carter Lisnow Respite Center isn’t far from the marathon start line, and Cindy said the center is one of the marathon’s official charities each year. Katie said she has run as a charity runner each year. Katie described a point during the 2018 race where she was helping block the wind for Cindy and warning her about a big puddle — despite the fact that they were already drenched. Both Cindy and Katie mentioned that the weather conditions led to laughter during the race. “It’s nice to be able to share with the person next to you who you love dearly, like ‘this is a little miserable today’ and have them agree, or ‘this is kind of funny,'” Katie said. Cindy said among the things they talked about were Katie’s upcoming wedding, another daughter’s recent wedding, politics, work and her grandson. “We talked the whole time,” Cindy said. She said they took it easy, stopping a few times. Cindy has also had to recover from an injury; she fractured her fibula in the fall and had to take some time off from running. Although the weather was not ideal, the heat at the Boston Marathon in 2012 was worse in her opinion, Cindy said. Katie said it was the third time they ran this race together, the other two being the year of the bombing at the event, 2013, and the year after that. With the weather conditions in 2018, Cindy said she noticed there were fewer spectators than usual, although there were still people out there. “We were thanking people left and right,” she said. The whole family is involved or has been involved with running. For Cindy’s 50th marathon, she ran the Honolulu Marathon with her three daughters, she said. As her mom and younger sister ran the Boston Marathon this year, Cindy’s middle daughter, Christine Morud, watched the race from her honeymoon in Hawaii, Cindy said. Cindy is also the cross country coach at Bishop O’Connell High School, and Morud works with her as assistant coach. Cindy said her son and husband have run, as well. Even when they aren’t training for Boston, Katie and Cindy will sometimes do long runs together, Katie said. She said they like meeting at Theodore Roosevelt Island for runs. Cindy said it’s impossible to put into words how thankful she is that she has the opportunity to run with her daughter. “It’s an absolute blessing that I can run a marathon with one of my children,” Cindy said. Katie expressed a similar feeling of being lucky to have time running with her mom. The mother and daughter finished the race in 4:43:49. “It’s still a hard thing to do, run 26.2 miles, but we were pretty happy the whole time — and really happy when we finished and took a hot shower,” Cindy said. Copyright (C) 2018 Run Washington. All rights reserved.